Yes, it's just like a mouse. 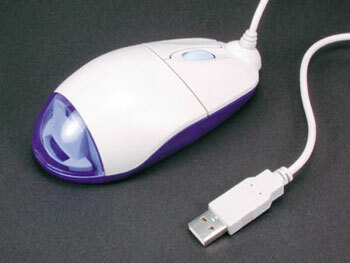 CP-1 is a transmitter mouse with a sensitive condenser microphoneg built in it. CP-1 starts working as soon as you connect it to the USB port of your PC. Power is supplyed by your PC. CP-1 keeps on transmitting if the PC is on. Once you switch off the PC, CP-1 stops working. *Exterior look and specifics are subject to change without warning. Dimensions: 53 x 95 x 35 mm.